In this new environment, we'll see personal success defined through the success we bring to other people's lives. At Kern and Burn we believe one way to create value is through writing. It doesn’t have to be critical, it doesn’t have to be long-format, it just needs to be thoughtful. (A strong thread of thoughtfulness runs through all the articles in The Manual.) If we can inspire more designers to write thoughtfully about their work, or at least read the work of others, then we can give back in a way that hopefully gets designers excited about the opportunities available to them today. 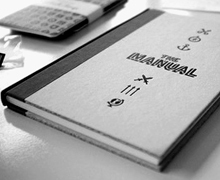 We recommend ordering a copy of The Manual here. Shut your computer, start reading, and allow its authors to challenge the way you do things.